A popular financial ETF is carving out a textbook reversal setup. This has been a trying year for investors. After posting stellar returns in 2017, the big S&P 500 index has jarred investors with a pair of surprise surges in volatility in February and October of this year, shoving the big index into negative territory (albeit briefly) both times. After October clocked in as the worst month for the stock market since 2011, market participants are understandably feeling a little uneasy. That's especially true in the financial sector, which remains in negative territory year-to-date, as of this writing. Simply put, financial stocks have been systematic underperformers all year long. But that could finally be about to change. To figure out why, we're taking a technical look at a major reversal that's being carved out in the popular SPDR Financial Select Sector ETF (XLF - Get Report) . At a glance, it's been hard to read the overarching trend for XLF in 2018. While XLF ended the summer bouncing higher in an uptrend, that positive trend reversed course back in late September, and it's been downhill ever since. The good news is that a little order is coming into the madness that has been XLF's price action. Shares are forming a textbook example of an inverse head-and-shoulders pattern, a bullish reversal that signals exhaustion among sellers. 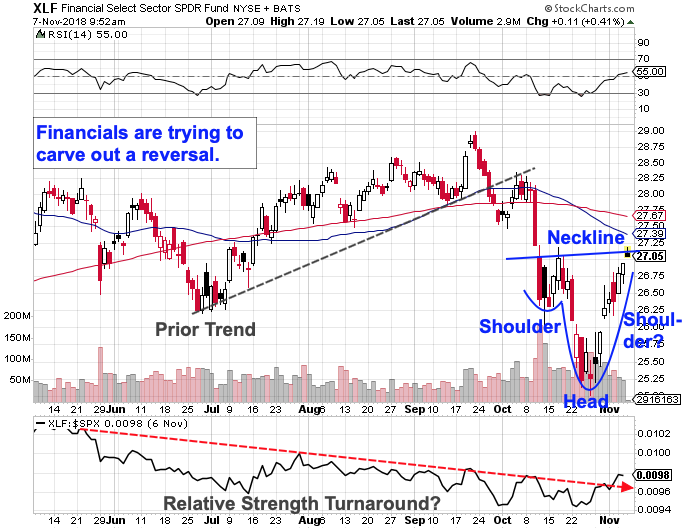 XLF's inverse head and shoulders is currently establishing a neckline level, which sets the stage for a break higher. Simply put, if XLF can materially push through the $27.25 level, the path is relatively clear for a re-test of prior highs up above $29. Relative strength, the indicator down at the bottom of the XLF chart, adds some extra evidence for a bullish reversal in XLF. This ETF's relative strength line has been trending lower in the long-run, even during the late-summer rally that financials experienced. That indicates that the financial sector was systematically underperforming the rest of the broad market. Now, an early-stage breakout in relative strength could be the start of a more sustained push higher, as buyers re-take control of the price action. It's important to note that XLF doesn't need to fully complete a right shoulder in order to trigger a buy signal at this point - this ETF's ability to catch a bid meaningfully above $27.25 is enough proof that buyers are back in charge. At this point, shares are within grabbing distance of that breakout buy signal. That's good reason to keep a close eye on XLF in the trading sessions ahead.